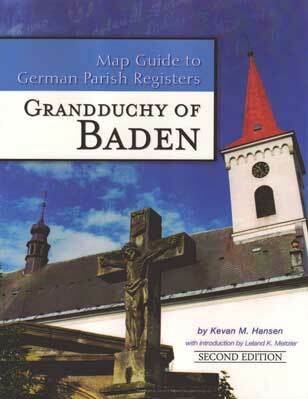 Published by Family Roots Publishing Company, This new Baden volume is made up of over 2,226 places and the book has a total of 291 pages. A new Introduction written by Leland K. Meitzler. More detailed Overview Maps, with place names added for the surrounding states and districts. Redrawn Amt Maps, with extra-bold lines on all the outer borders that border other Germanic states, as well as the addition of the names of the neighboring districts. Complete rearrangement of the four local districts that make up Baden. The Lutheran and Catholic parish maps now follow each other within the Bezirk (district) section, keeping the data for each district together. They are: Bezirk Freiburg, Bezirk Karlsruhe, Bezirk Konstanz, and Bezirk Mannheim. Corrections and additions have been made to boundaries, place name spellings, and Family History Library film numbers for Lutheran, Catholic, Jewish and Reformed parishes. Finally, six parishes have been added to the Amt Rastatt Parish Key. Additional Family History Library film numbers have been found and added to numerous Parish Keys. And besides all that, a new-technology non-curl laminated cover makes the soft-cover book an absolute beauty! This is the second of a series covering all of Germany, a series whih is still in production. Even the smallest places are listed in this series – some with as little population as one person! These places are as of about 1870. If the place existed prior to that date, it will most likely be listed. If the place was named after that date, the chances drop.